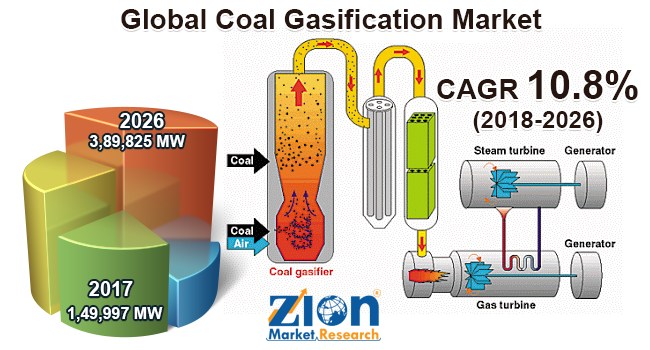 Zion Market Research has published a new report titled “Coal Gasification Market By Application (Fuel Gas, Feedstock, Power Generation, Fertilizer, and Chemical Making), and By Process Type (Moving Bed, Fluidized Bed, Entrained Bed, and Molten Bed): Global Industry Perspective, Comprehensive Analysis, and Forecast, 2017–2026”. According to the report, the global coal gasification market was valued at 1,49,997 MW in 2017 and is expected to reach around 3,89,825 MW by 2026, growing at a CAGR of approximately 10.8% for the forecast period 2018 to 2026. The global coal gasification market is segmented based on application and process type. By application, the coal gasification market is distributed into fuel gas, feedstock, power generation, fertilizer, and chemical make. By process type, this global market is categorized into moving bed, fluidized bed, entrained bed, and molten bed. The fertilizer segment is anticipated to hold the major market share during the forecast time period. In 2017, this segment held more than 40% of the market share in terms of volume. Ammonia production with the help of coal gasification process has increased the demand fertilizers that are rich in nitrogen. The other segment that promises to show a good growth rate, above 10.5%, is power generation. The growing trend of integrated coal gasification combined cycle (IGCC) power plants worldwide has increased the opportunities for coal gasification in power generation. The demand for coal gasification technology has increased in fuel gas production, owing to the increased use of synthetic natural gas. The entrained bed segment held the largest market share, around 48%, in 2017. The advantages of this process, such as flexibility in any coal feedstock and to generate clean and tar-free syngas, has increased its demand in the global market for coal gasification. This segment is also anticipated to register the highest CAGR, of above 11%, during the forecast time period. The moving bed segment is also anticipated to contribute a good market share during the estimated timeframe. This process involves the moderate requirement of steam and oxidant and provides fuel and load flexibility, which, in turn, increases this process’ demand on a global scale. By region, Asia Pacific contributed a major market share, of above 75%, in terms of volume in 2017. The region is also anticipated to register the highest CAGR during the forecast time period, thus, retaining its dominance. The Asia Pacific region is the largest coal producer and the increasing energy demand in the region has positively contributed to the region’s coal gasification market. According to the World Energy Council, approximately 37% of the total coal recoverable is reserved in the Asia Pacific. The Latin American coal gasification market follows the Asia Pacific and is anticipated to register a CAGR of above 9%.